Venom to Get an "Epic" in the Fall of 2018... Another One? Home » BC Network » Recent Updates » Venom to Get an “Epic” in the Fall of 2018… Another One? Venom to Get an “Epic” in the Fall of 2018… Another One? Later this year, Sony and Columbia are putting out a Venom movie. It is the 30th anniversary year of the creation of the alien symbiote character. And Marvel Comics is making sure you have all the Venom comics you could possibly conceive of. We have had the weekly Edge of Venomverse and Venomverse. We have just finished the Venom Inc. crossover. We are about to begin Poison-X, the Venom/X-Men crossover. And in April we get another Venom weekly comic, Venomized, alongside two issues of the regular Venom more-than-monthly Marvel Legacy series. 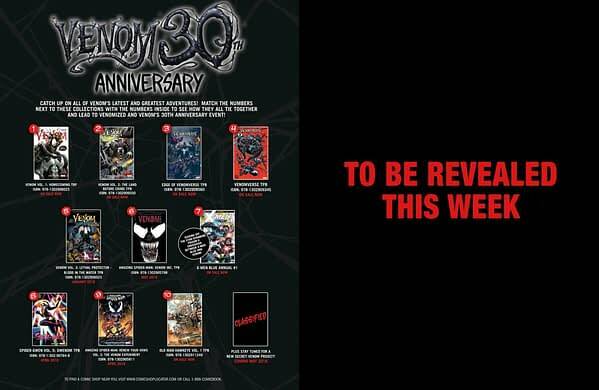 Now the Venomized weekly mini-series was promoted as the end of the Venom storyline that ran through all these books. But Marvel appears to have only just begun. And I don’t mean even more Venomized variant covers running throughout the line in April. Which means, come the autumn, there will be even more to add to all the Venom groaning on your shelf. Black Bolt, Iron Fist, and Monsters Unleashed: The Next Titles on Marvel’s Chopping Block?